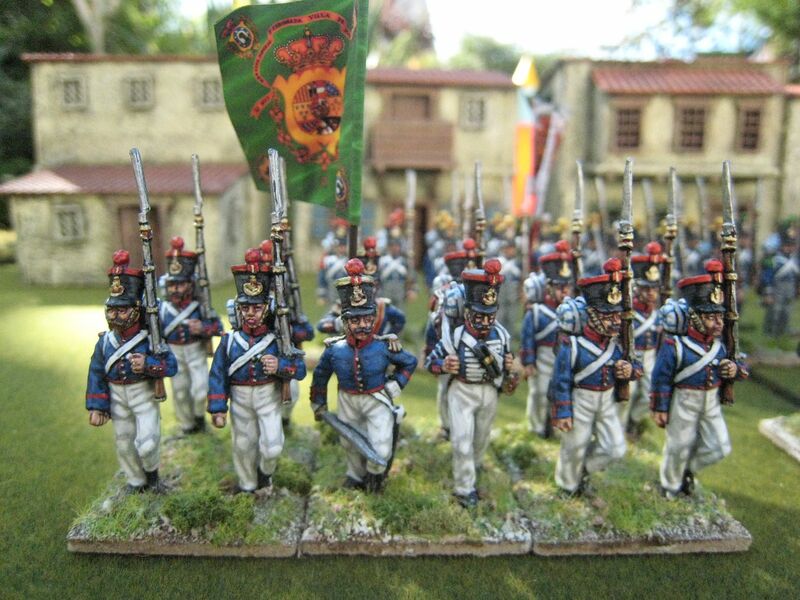 Here are some photos of the "foreign" element of my Isabelino army: the British Auxiliary Legion and the French Foreign Legion. 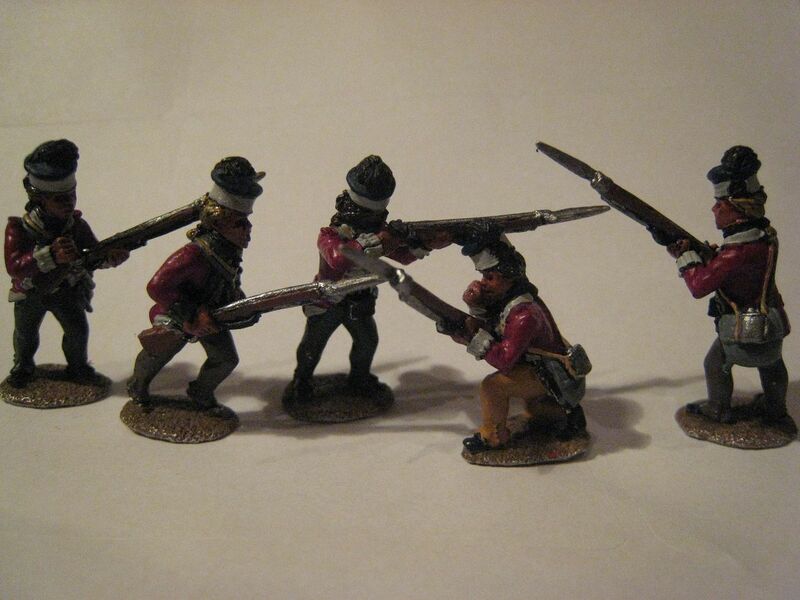 There was a Portuguese force as well, and hopefully at some stage Perry Miniatures will release figures for that. The BAL started off with 10 line infantry battalions, a rifles corps of about 500 men, 2 regiments of cavalry and an artillery corps. This volunteer force was paid directly by the Spanish crown and was not the responsibility of the British government, which was reluctant to commit regular troops to the conflict. As it happened, units of the Royal Navy, the Royal Artillery and the Royal Engineers did participate in the war. 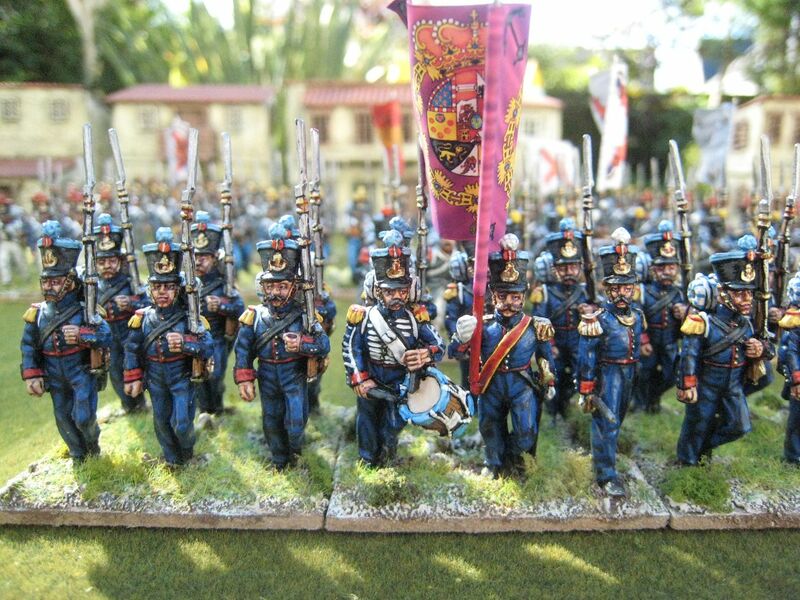 To date I have 3 of the infantry battalions, the 7th, 9th and 10th, together with the rifle unit, a battalion of Royal Marines and some artillery. I recently finished a lancer cavalry unit which I'll post about next week. From what I can tell, the BAL tended to fight its battles without much Isabelino army support, so I'll need to bulk the force up to 8 infantry battalions and a full artillery compliment. 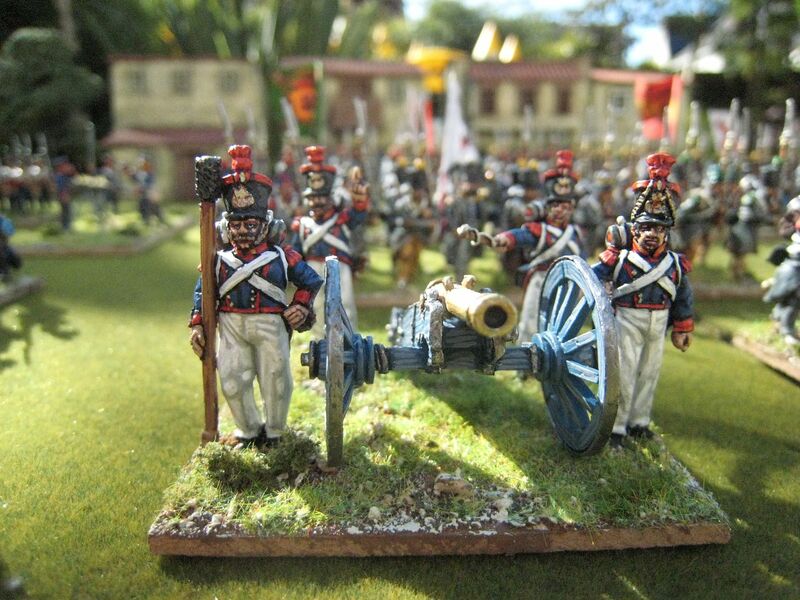 With hindsight, I should have painted the artillery in uniforms that are a much darker blue; I might see if I can remedy this when I next paint some. 10th Regiment, "Munster Light Infantry"
7th Regiment, "Irish Light Infantry"
I blogged about the the FFL recently, so won't do so again here. 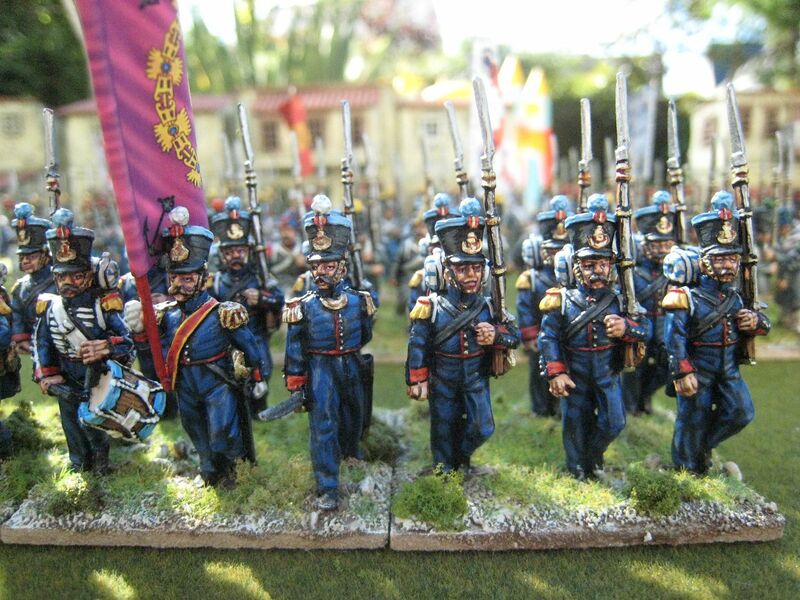 I plan on raising 2 infantry battalions to start with (I have 1 and a bit), and some cavalry. After the regular army units are the provincial militia regiments. 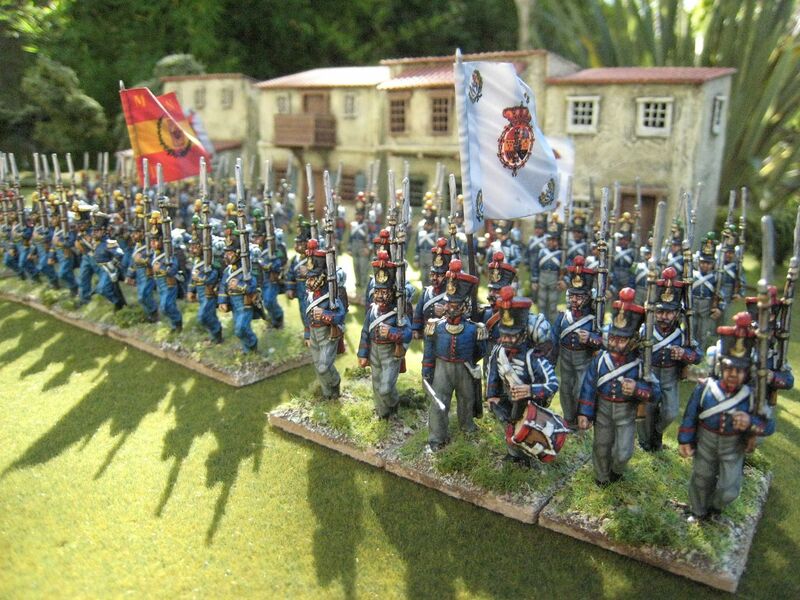 These were smaller units raised on a city by city basis and which supplemented the regular army. 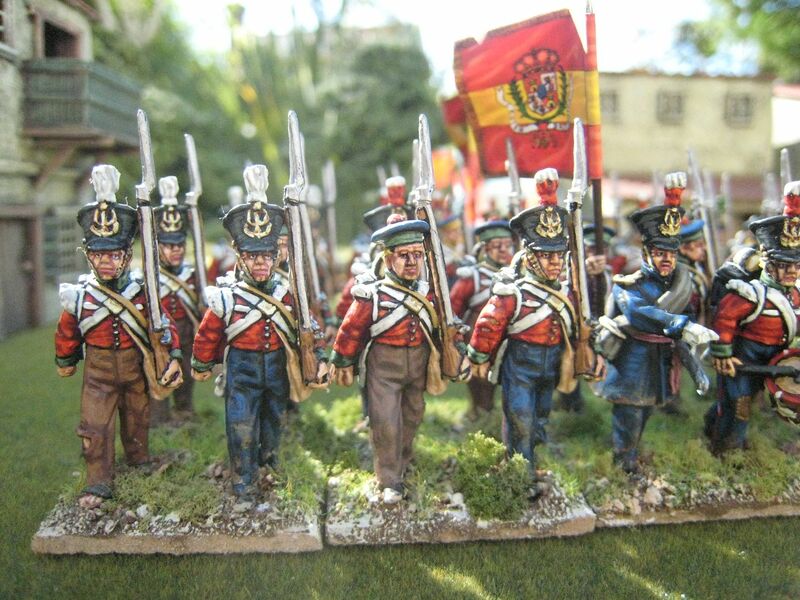 I have two of these, the Madrid and Pentevedra militia, or 12 figures each (the flank companies would have been detached to form the Royal Guard). Finally, there is the Zaragosa National Militia. The national militia was different to the provincial militia, and was more like an urban-based paramilitary and police force. Their primary function seems to have been to defend the cities from Carlist attack and sedition. I chose the Zaragosa because of its attractice uniform of sky-blue trousers and yellow piping. 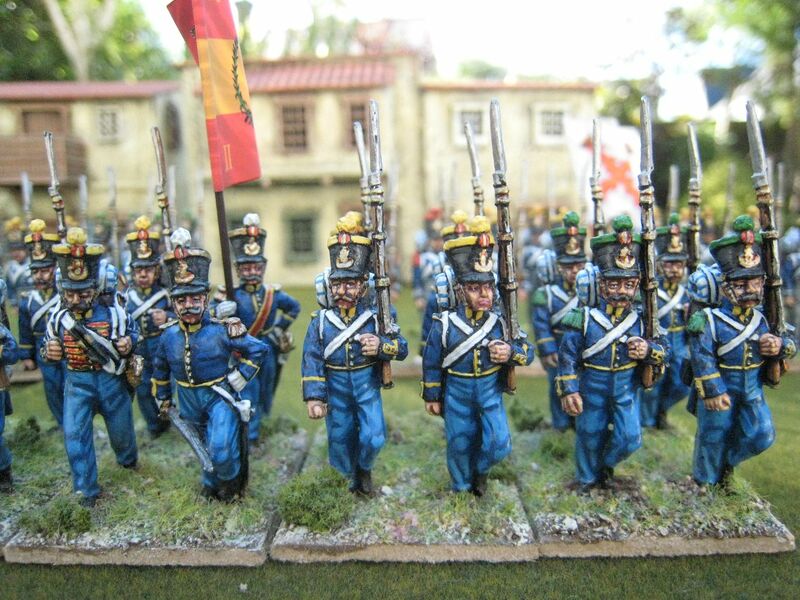 These units add some colour to what would otherwise be a largely over-coated army. 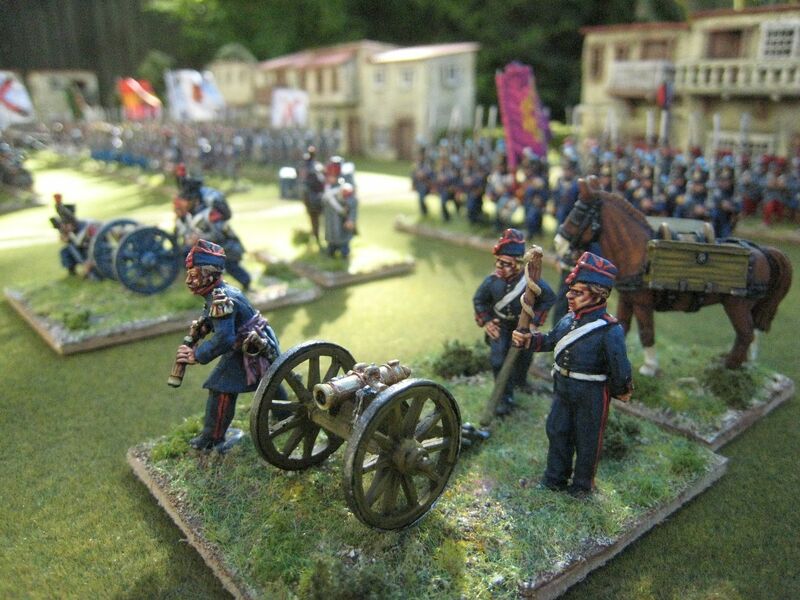 I don't have many guns as yet: 2 foot artillery crews and 1 horse artillery. All the buildings are made by Paul Darnell/Touching History. 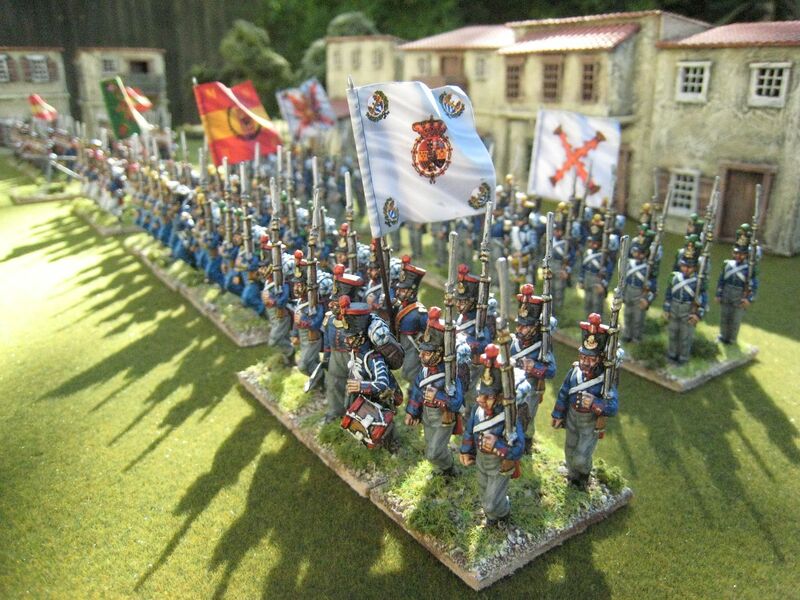 Flags are from Adolfo Ramos and the figures are, of course, from the Perry Miniatures range. 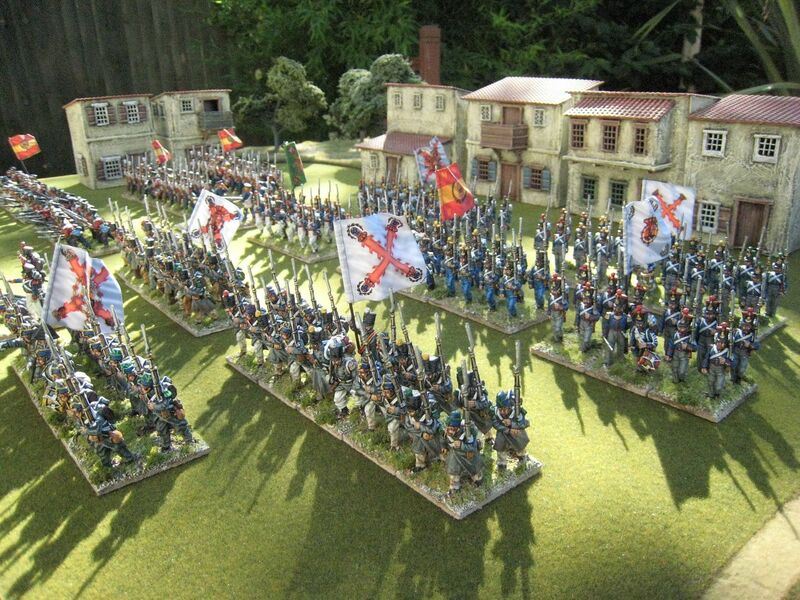 I hope these photos show what a colourful period the First Carlist War can be. Over the next couple of days I'll post the remaining photos on the foreign auxiliary troops. 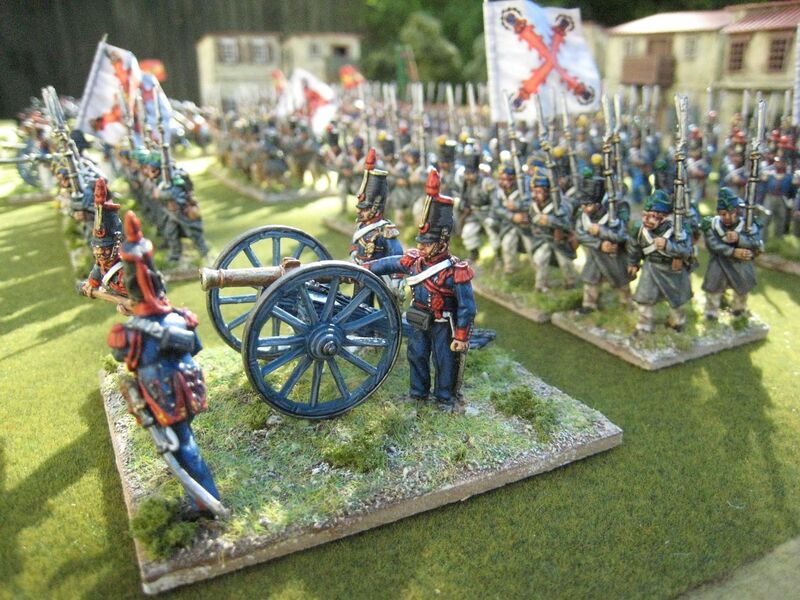 A few months after the FFL arrived in Spain, its commander, Colonel Joseph Bernelle, decided to form an artillery battery and a unit of lancer cavalry. These appear to have been staffed from existing legionnaires, so presumably were trained from scratched. 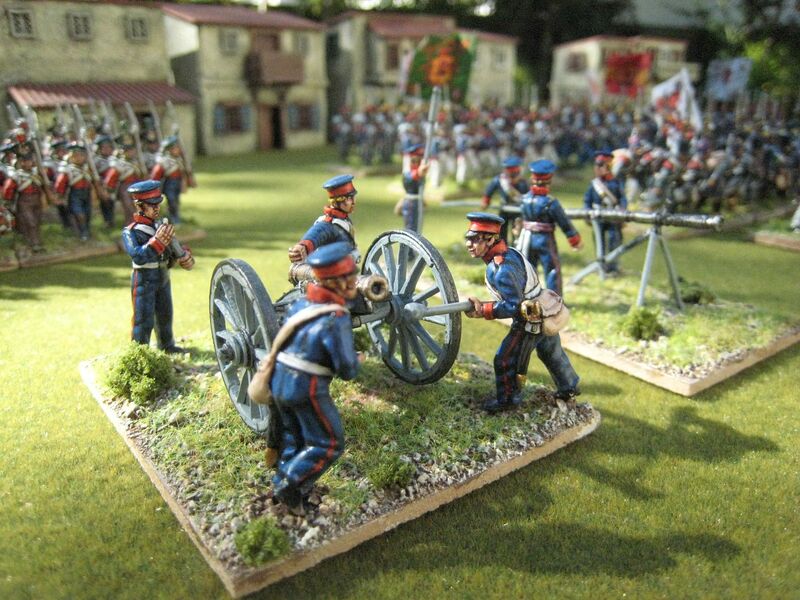 The artillery battery was equipped with small calibre mountain guns. 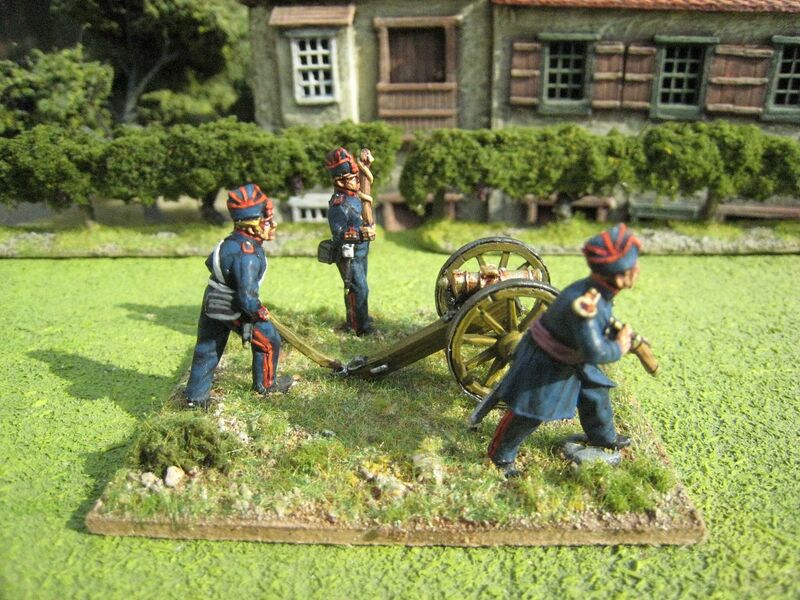 I used this pack to try out some new Vallejo paints for the colour of French artillery woodwork. 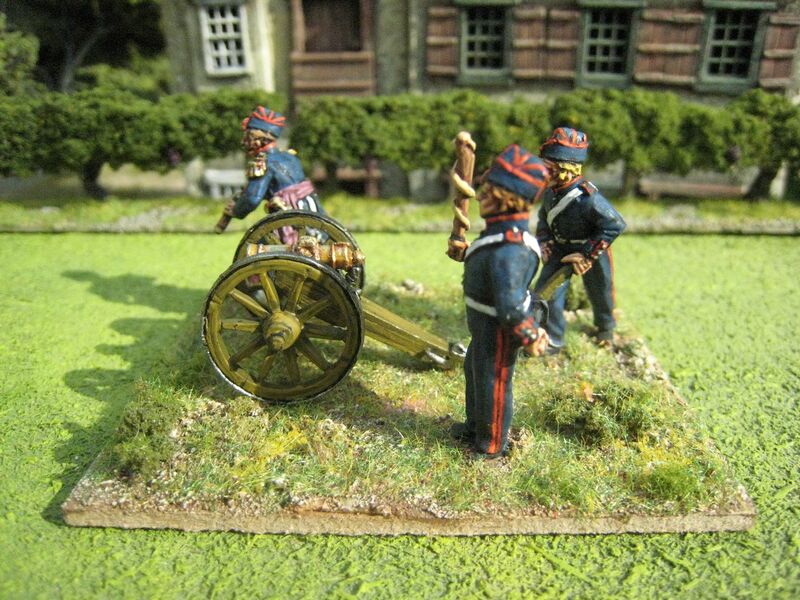 When I last painted a French cannon (a Foundry Napoleonic set) I wasn't really happy with the colour, despite the use of the Foundry Napoleonic French artillery palette. "French Artillery Green" is one of those colours that seems to change all the time. 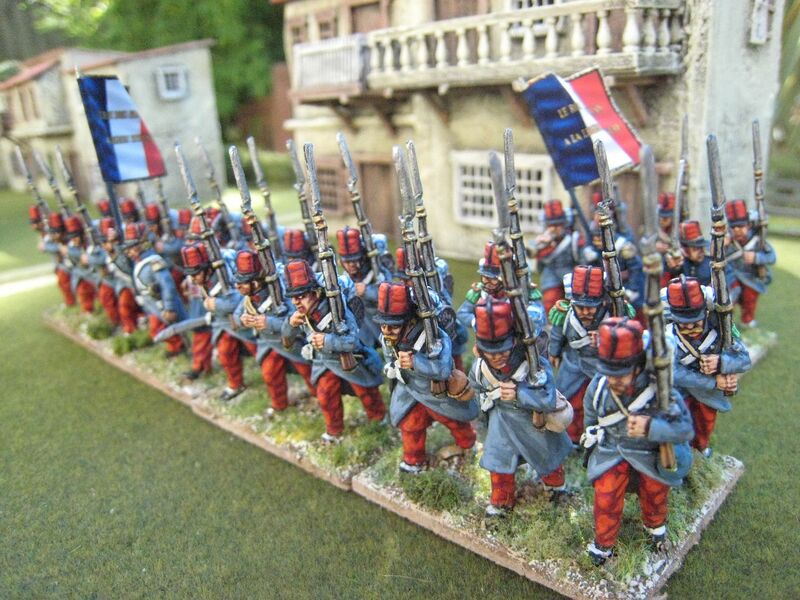 Apparently the opriginal mix was 1 part black to 100 parts ochre, but I've seen many model French guns on the internet which are far more "green" than "ochre" (on the Perry Miniatures site, for example). 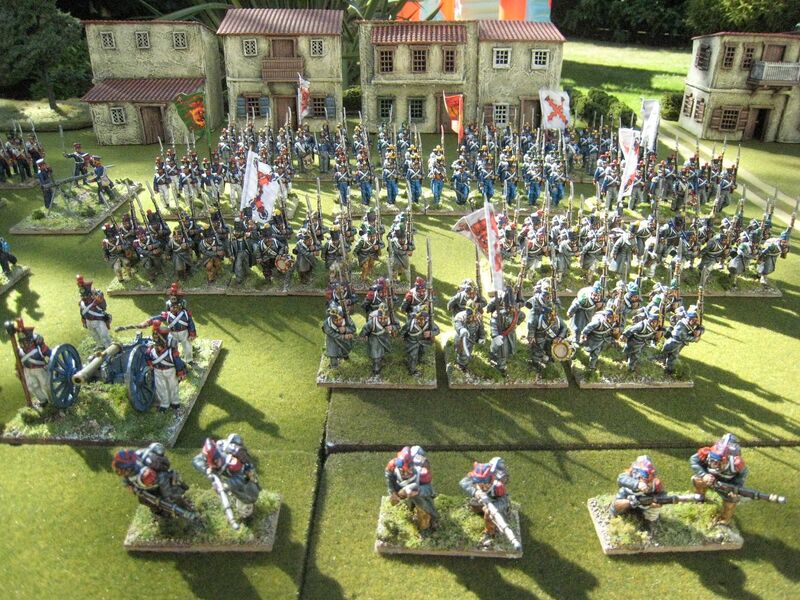 I just don't know how accurate this is, although there are guns at the Tower of London that look pretty similar and I now lots of wargamers have gone for a more apple-green colour. I looked at the paintings in the (admittedly older) Ospreys and decided I wanted to have a more olive colour that captured my traditional idea of French artillery green. As I say, I may well be behind the times a bit here. I decided on Vellejo paints, which I usually don't use on account of their pipette delivery system (which to me seems rather wasteful). For the gun here I used "Yellow Green", "Dark Yellow" and "Japan Uniform WW2", variously mixeed together and with black added for the original undercoat. 4 figures and a mule. Painted May 2012. I tried waiting for the sun to come out to take some decent pics of the finished figures (or try to) but it wasn't happening so here are some artificially lit photos. Anyway, here are the 5 highlanders with everything finished. I find that when I do the basing I usually find some paint that's rubbed off and needs touching off - with these figures I suspect it will be the highlighting on the feathers. The black leatherwork, cartridge case and feathers were highlighted very discretely with Foundry "Charcoal Black 34B and C". Buttons and other pewter/silverwork/buttons were painted with Foundry "Gun Metal 104C". Finally, various bits were touched up and some blacklining redone. I said that I'd mention the grey haversacks. I've never really found a satisfactory palette for this item of kit. Troiani paints it in a variety of browns and beiges, Mollo has almost pure white and Embleton in his Ospreys has a sort of dirty grey colour. I've not managed to nail "natural canvas" but when I first started painting AWI British infantry I went for the Embleton dirty grey. Following Embleton paintings does carry some risk - I find he dulls his colours quite a lot, especially in his later Ospreys, and his lighting can be a bit iffy so God knows what colour his grey haversacks are supposed to represent. The colours I've used here are Foundry "Stone 57B and C", and then a further highlight of C mixed with white. In this photo the colour does look quite light, so maybe it's ok. 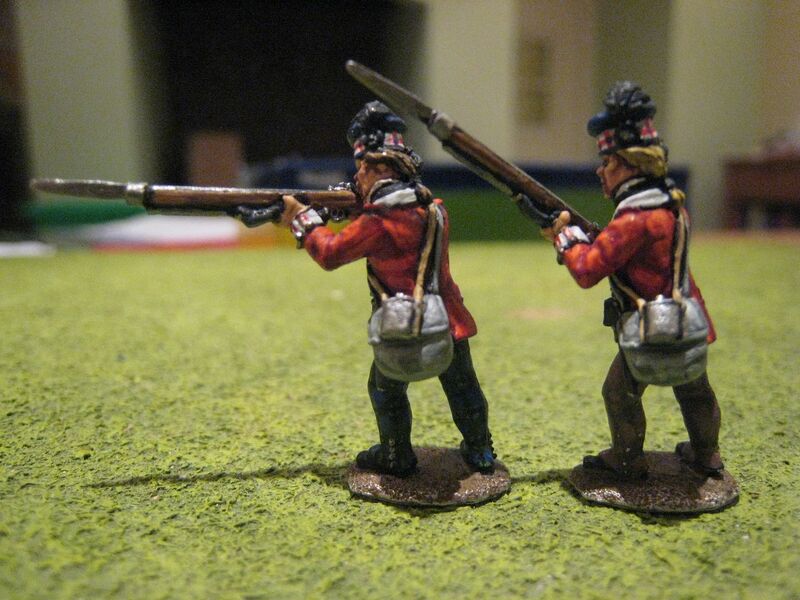 I'm actually experimenting with different haversack recipes at the moment with my Bunker Hill rebs. Now I just need to think about how I'm going to base the 71st figures. Once I've done a bit of reading and studying I might post my thoughts on the smaller scale actions that the 71st fought in. 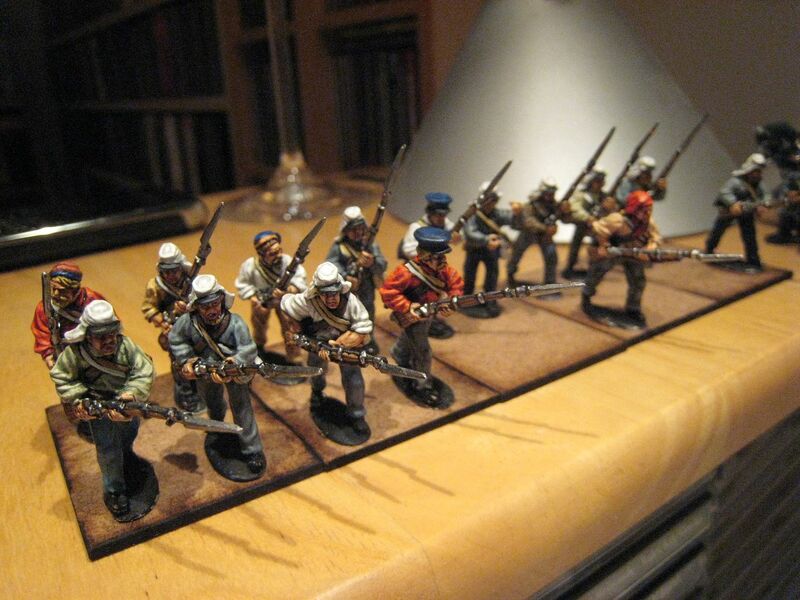 On the painting table at the moment are the remaining 8 figures of the ACW Bunker Hill packs I bought at Salute and some Eureka French civilian types. 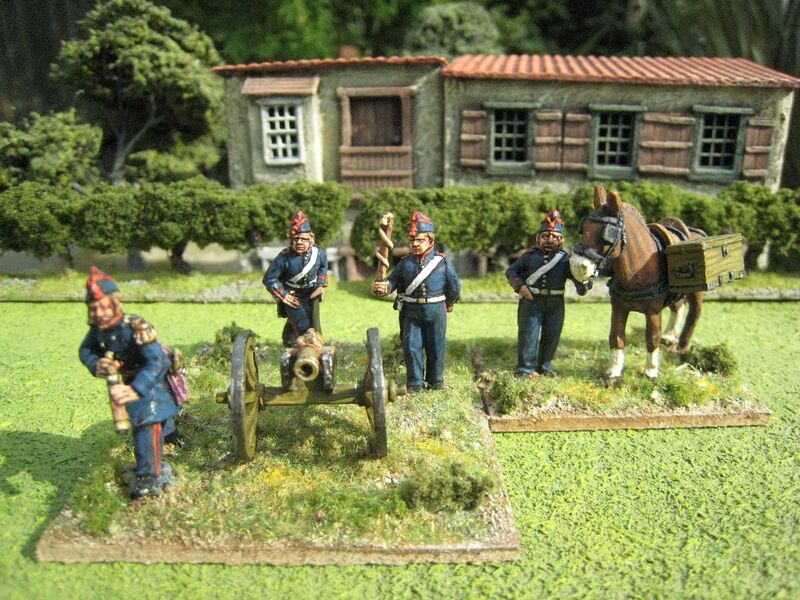 Once those are out of the way I need to paint more AWI highlanders and some French 1815 artillery that have been in the queue for ages. 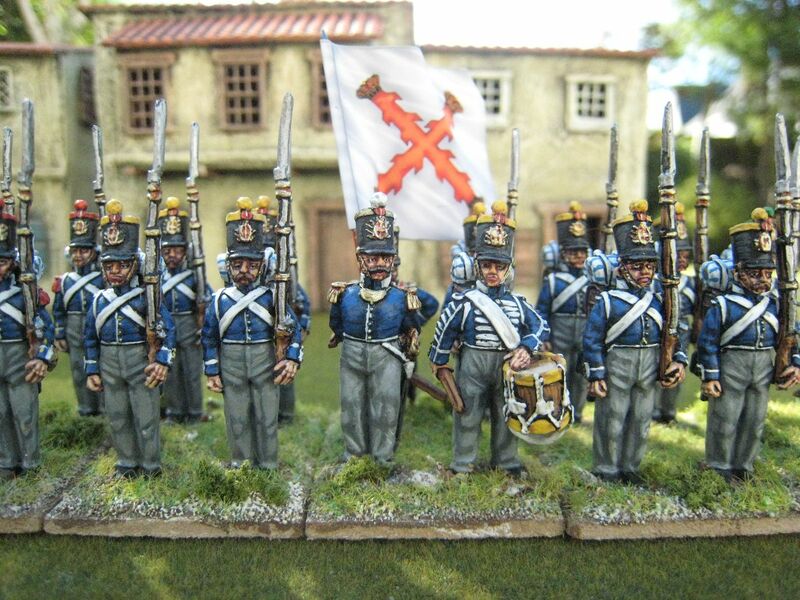 This week I'm hoping to post about the remaining First Carlist War units I've painted over the past couple of months. I have some catching up to do with posts, which is good as work is going to be bad and it's Hugo's third birthday in mid-December (so he's old enough how to have multiple weekend parties with different groups of people....). I finished the tartan trews this evening so I'll just post about that and then leave all the finishing off for tomorrow. I don't think painting tartan is actually that difficult. Yes, you need a steady hand and a very fine brush, but otherwise it's just a question of keeping one's nerve. It takes time, but I don't think technically it's as difficult as some people think. I think highland socks/hose is way harder to do. Anyway, this is my recipe for government sett, the standard AWI tartan. As I mentioned before, the base coat I use is very old GW "Dark Angels Green". The next stage is to place dark blue squares in a check formation from top to bottom of the trews. It's very important that these form convincing lines down the trousers - bear in mind the shape of the leg and that it's not just a question of a perfect vertical. On these two figures, one of the legs is bent forward, so the checks need to follow that incline to look natural. The blue I've used is Foundry "Deep Blue 20C". It looks quite bright in the photo, but actually against the dark green background it does look much darker - I lost track of the checks a bit when I put the green ones in. I always find that placing the first blue check on the knee acts as an anchor and it's easier to form the vertical lines once that one is in place. I also find that the effect is increased if you don't just apply full checks where there is space to do so but follow them through right to the edge of the trews - the final check at the belt might just be the smallest dab of paint, but it still suggests that the pattern is continuing. The next stage is placing a line of green checks in the spaces between the blue ones. This is like a "X" - imagine the points of the x are the blue checks and in the middle goes the green one. The shade of green is entirely dependent on what look you want your tartan to have. If you are going for an ultra-realistic dark blue/dark green blend, then use a medium green. I've chosen a green which on its own is pretty bright - Foundry "Bright Green 25C". However, the brightness will be toned down substantially once the black lines are painted through it, so I use this colour in order to maintain a clear distinction between the blue and green check. Anything darker, and I think it would all merge into a bluey-green mess (which as I say is probably more authentic and some people may prefer that look). It took me about half an hour to do these two pairs of trews. I had already decided that I wanted to add a patch to one of the figures. This is something shown in various Troiani pictures and I wanted to have a campaign dress look for my 71st - i.e. gaiter-trousers of varying colours and lots of patches. The patch itself was painted with Foundry "Deep Brown Leather 45"; the stitching is Foundry "Canvas 8A". The end result is not quite as messy as it looks in the rather blurred photo on the right. Tomorrow I'll do the final highlighting on the black leather and haversacks, add the silver buttons, and generally tidy up. 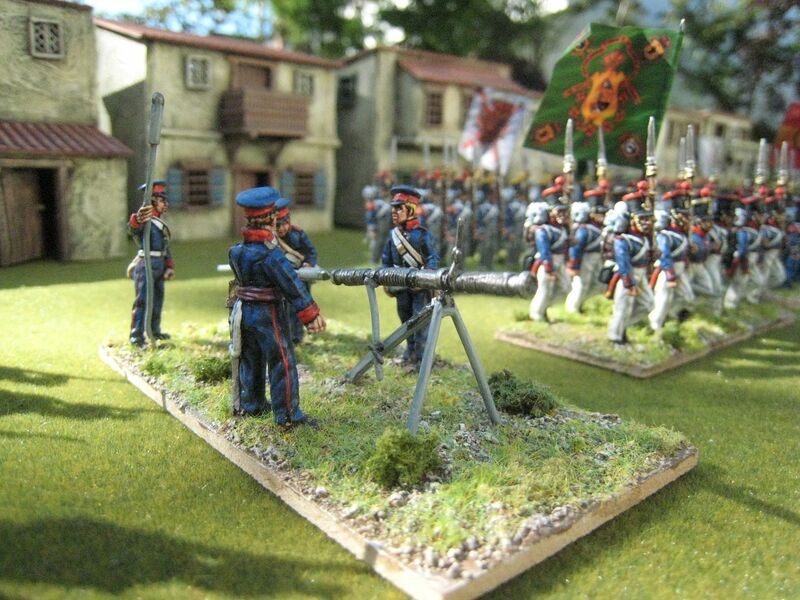 I managed to finish the batch of ACW rebs I'd started on Wednesday - with another 8 figures to go, this will give me one finished unit and a couple of stands of another one. I've used various paints for flesh over the years. Currently, I'm using the Foundry "expert flesh" set, which is 6 colours. I only use 5 of those - I miss out the final highlight, 127F, as that really is too light I think. As I mentioned in my first post, I use 127A as the base coat and then wash everything with Winsor &Newton Peat Brown ink. This is quite a dark ink, and nothing like the "chestnut brown wash" which GW used to make and which I used a few years ago. This ink pools in the eye sockets and this replaces any need to use black paint as a background for the eyeballs (I haven't used the "black eyesocket" method since about 2003, when my then girlfriend asked what type of mascara my figures were using...). I know many people don't paint eyes and/or think that to do so is completely out of scale. That's a perfectly valid stance and the scale point is probably true. But then think about the size of buttons - everyone usually paints them, but are they any larger than eyes? Like many painters , I can see myself not bothering with painting eyes any more as I get older. At the moment, however, I'm more than happy to give the eyes a go. Personally, I think if done effectively painted eyes can add a lot of character to figures and help draw groups of figures together. My own method is to paint a white oval slit and then add the smallest black pupils that I can. I try to leave a bit of white between the bottom of the iris and the eyeball- that is because I think it looks a bit more realistic and also because it helps give that "1,000 yards stare" look. The greater the space between the bottom of the iris and the eyeball the more the figure looks as if he's looking upwards - what I call the "where's that cannon ball going?" look. There's no denying that I find painting the eyes the hardest part of every figure. Sometimes I have to do them several times to get them right; and sometimes even after several attempts I give up and just put the "bad eye" figures in the back row. I find that if it's getting too tricky an easier solution is to place the irises in the corners of the eyes, as if the figure is looking in another direction (perhaps the "what's happening on our flank?" look). 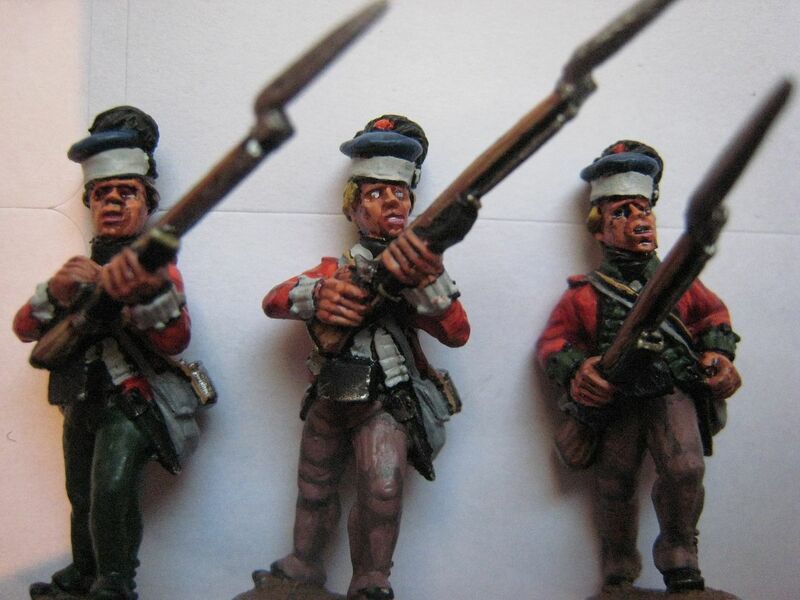 With firing-pose figures I always paint the right eye open and the left eye closed; that said I dimly recall reading somewhere that in the 18th century soldiers were trained to fire with both eyes open - perhaps a reader has further information on this. It's difficult to describe how I highlight the face itself, and there's right or wrong way, really. I use 127B to cover most of the face and then use progressively smaller amounts of 127C-E. I paint "eyebrows" with the B and C highlights - I find this is a good way of giving expression to faces. Slant the eyebrows down and you have a look of determination; arch them and you have surprise or worry. Upper lips are good for character too; incline one end a bit and you have a decent snarl. 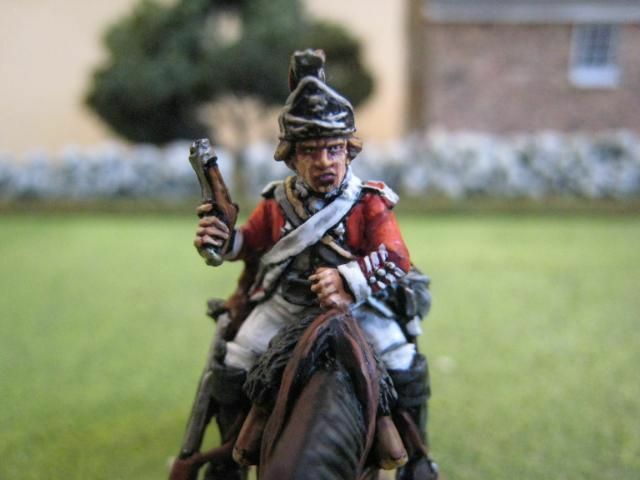 On the right is a face that I'm quite proud of, where I think the eyebrows, upper lip and eyes combined to give a real sense of character to this Perry British dragoon. Once I've finished with the Foundry 127 paints, I paint over any bits of the face that still have too much ink was he showing with Coat d'Arms "Dwarf Flesh", which is a darker flesh colour can tone down any of the highlights that look excessive. Black lining is something I've done since I first read about it in a White Dwarf heavy metal article in the late 1980s. It always requires a fair amount of tidying up and so is time-intensive, but at the moment it's part of my style. 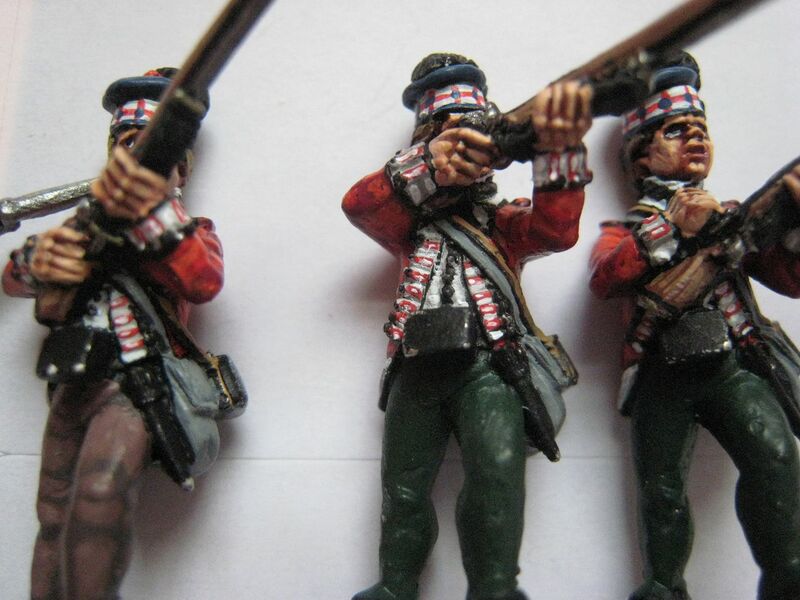 I have seen many figures painted without any black lining that look absolutely terrific (an example that comes to mind is Melbourne war gamer John Chadderton's Eureka French Revolutionary Wars figures), so one day I may well drop it. I've now done some final post-black lining highlighting and painted in the button-hole lace. Clearly trying to paint the exact lace would be daft, but I think it's good to paint an approximation of the lace to make it more interesting than a simple white line. What I do is look hard at the regimental lace until it blurs into a general impression (try the website here for replicas of regimental lace). This process invariably produces either a white line with a coloured blob in it or a coloured line with a white blob. In the case of the regiments here, the lace for the 71st is red with a white blob and for the 76th is green with a white blob. I looked again at pictures in Troiani, Mollo and the various Ospreys to see how the dicing on the bonnets works. What I hadn't noticed before is that all those pictures show a bit of blue underneath the dicing band, so I added this in very carefully after I'd finished the dicing. 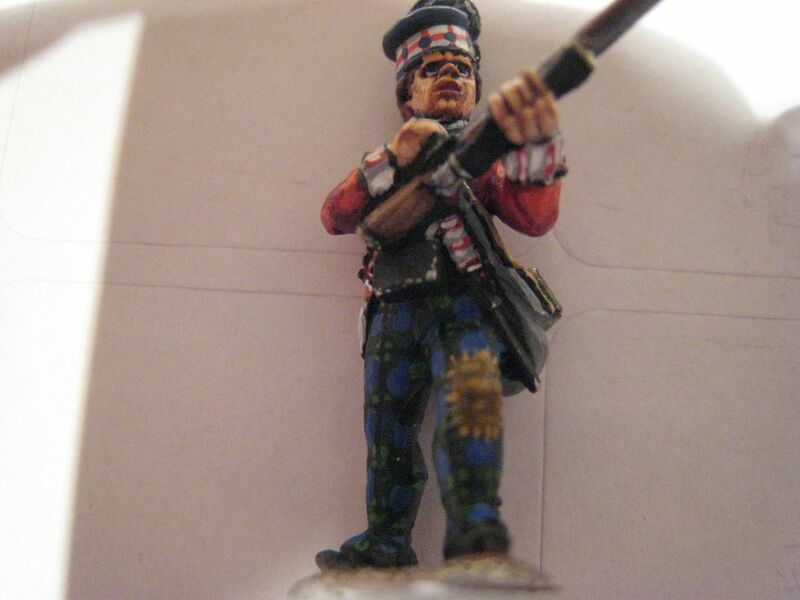 Next will be final highlighting and the tartan trews. 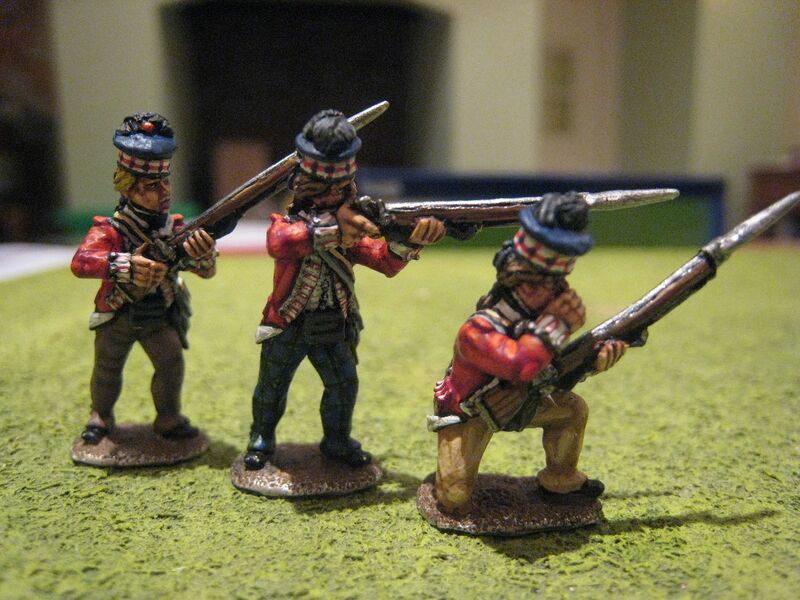 This afternoon I took a bit of time out to finish off the 7 Bunker Hill Virginians I had on the workbench, so the next post on these highlanders might have to wait until tomorrow. This morning I did most of the highlighting and a few details. This afternoon will be mostly faces. I highlight large items like coats, packs, trousers etc in standard 3-layer method, leaving smaller things like straps and facings to do after blacklining. 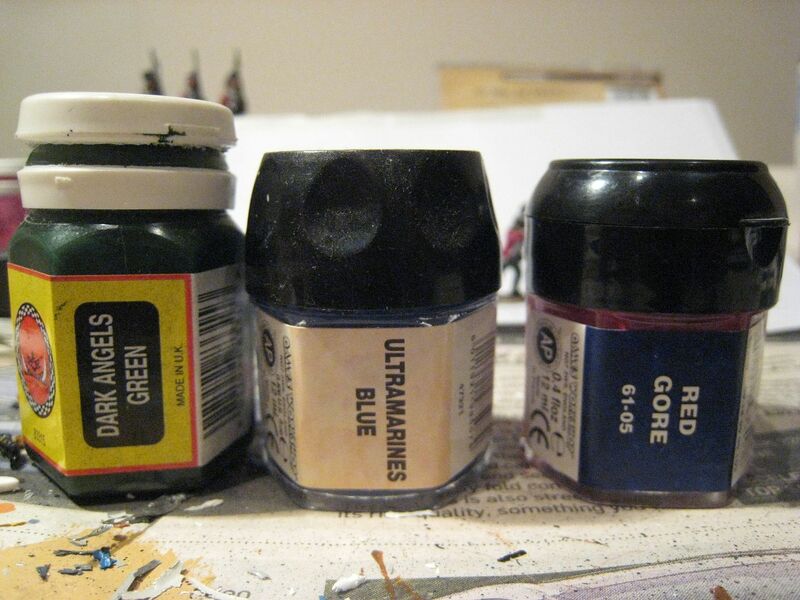 I mainly use Foundry paints, and sometimes the differences between the 3 colours in each palette are not sufficient and a further highlight is required - I do this mainly with blues and greys. On the buff gaiter-trousers I've added a third final highlight using Coat d'Arms "Bone 112". 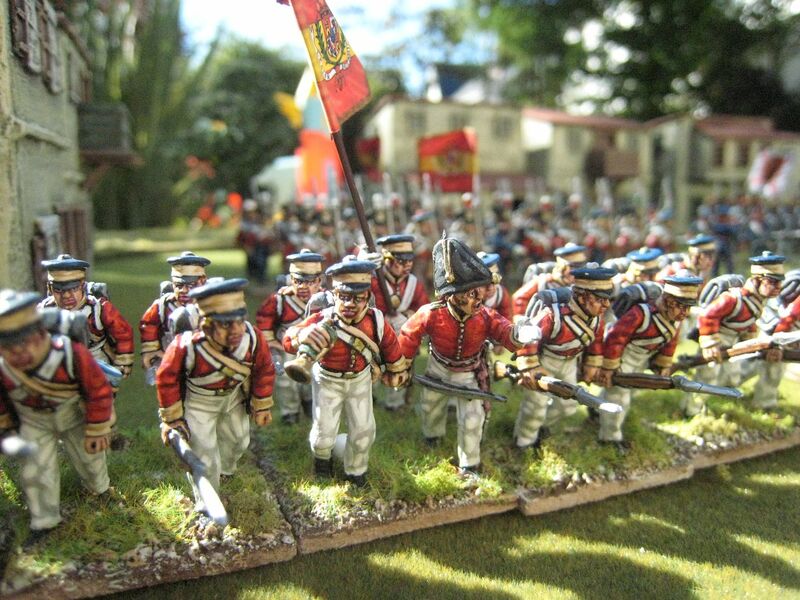 The red coats follow a recipe I've used since the very beginning of my AWI painting, almost 10 years ago now - base cot of GW "Red Gore", the "Blood Red" and finally "Blazing Orange". I haven't been into a GW recently but I know that those colours will either have been deleted or be called something else like Nurgle Death Gore. This creates quite a bright scarlet look, which won't be to everyone's taste. However, as regular readers will know I do tend to paint figures in a brighter-than-life style to help them stand out on the table. I always ensure that any unit has a good mix of hair colours. 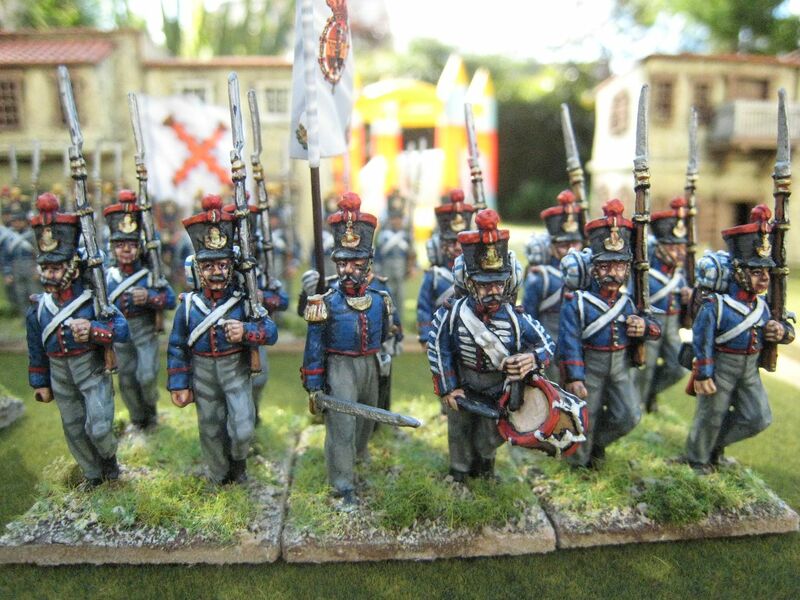 I don't really like painting hair black, although I have to with my Carlist War stuff as I don't think there were many blond Spaniards in the 1830s. As hair base colours I use more GW paints - "Bubonic Brown", "Scorched Brown" and "Bestial Brown." These are respectively blond, dark brown and light brown and I highlight them with Foundry "Ochre 4C", "Spearshaft 13C" and GW "Vomit Brown". Sometimes I use other browns just for variety. Once I've made progress with the main colours I do the faces and when I do the pupils in the eyes I blackline the entire figure. Then I finish the flesh and once that's over I feel like I'm at the tidying up and completion stage. 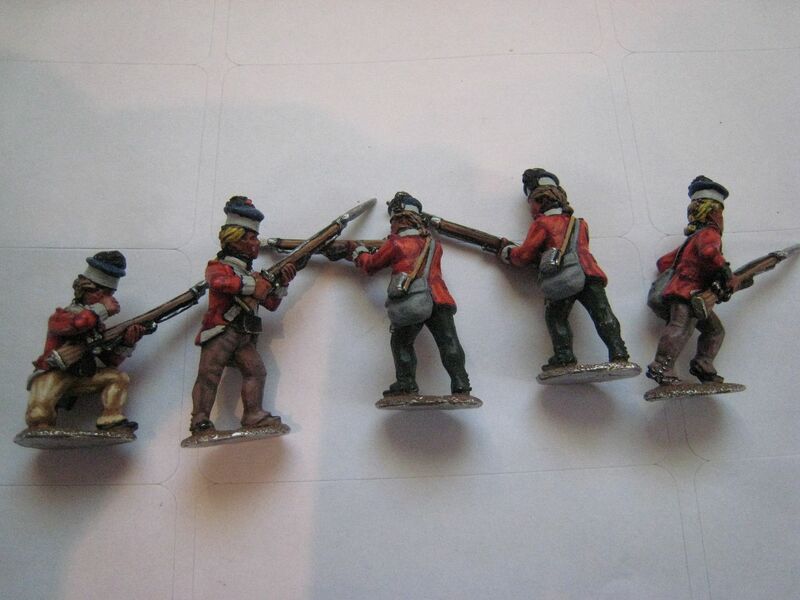 I've actually already done a bit of blacklining on the figures in then photo, on the muskets, in order to add the "Spearshaft C" highlight to the wood and the figures' hair (I don't bother with 2 highlights on muskets anymore; just the base "A" shade and then the "C" highlight. 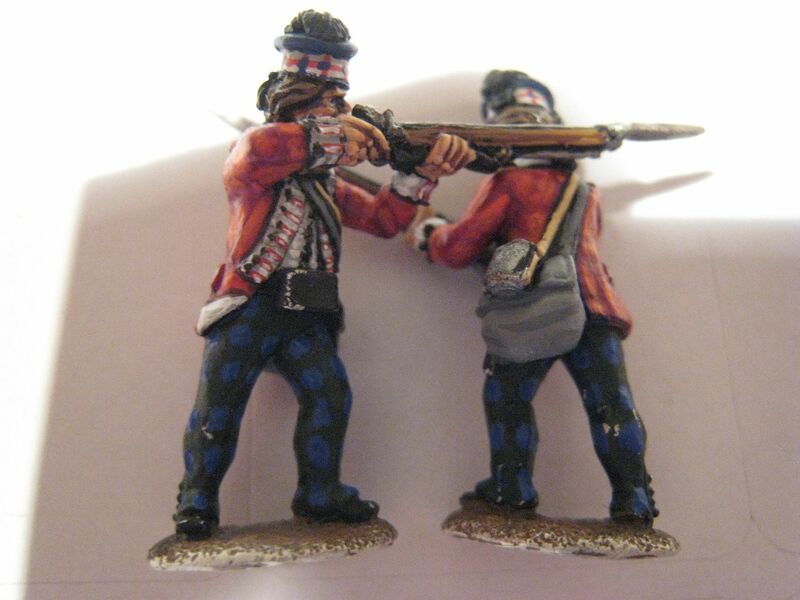 Talking of muskets, as these are highlanders the slings remains black, as with belts etc. I'll explain the grey haversacks later. 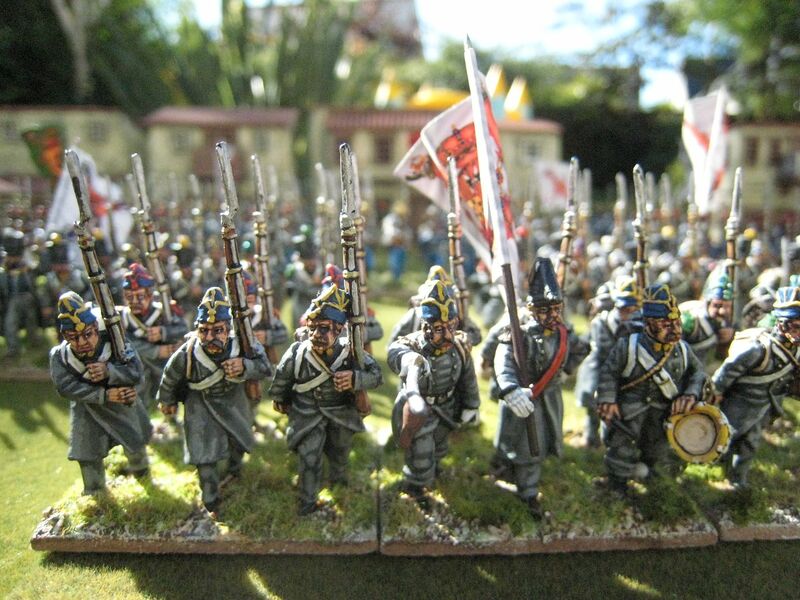 Yesterday I took delivery of about 200 AWI highlanders. 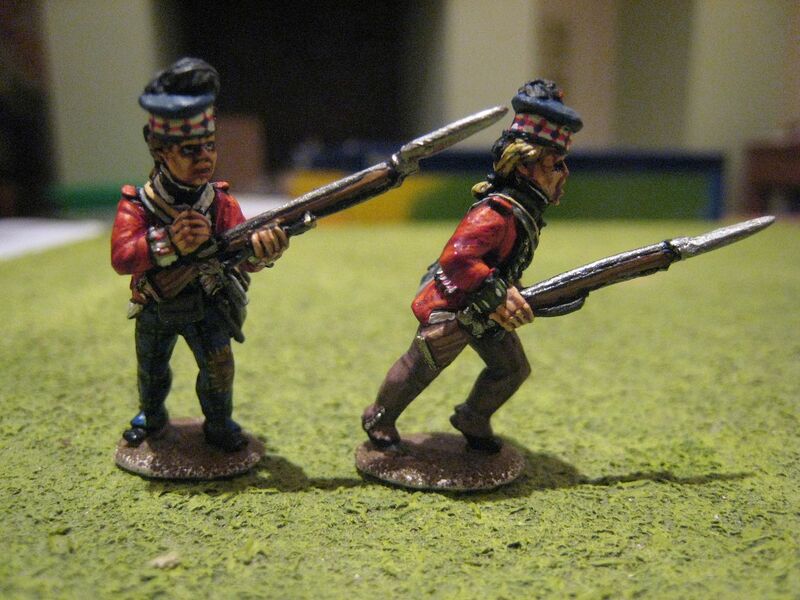 These are the rather excellent figures sculpted by Alan Marsh (of Eureka "ragged Continentals" fame) for Bill Nevin of the US and his "King's Mountain Miniatures." 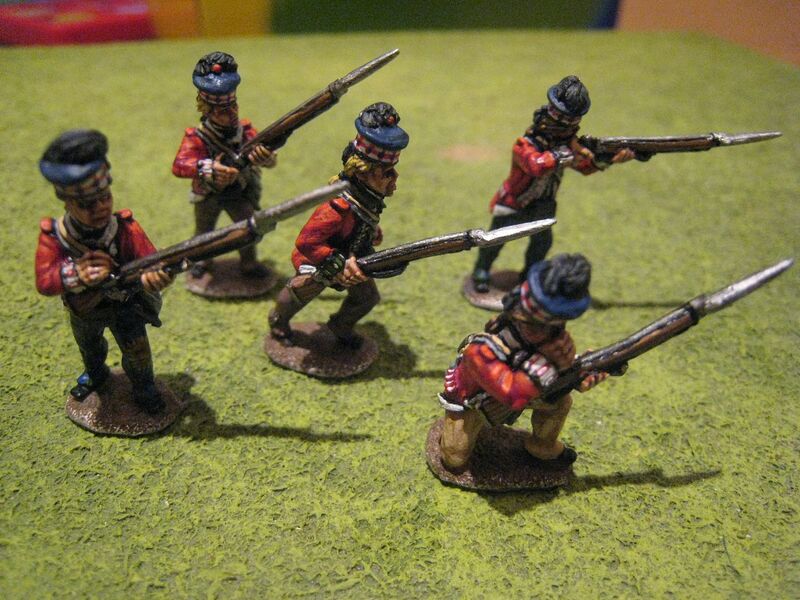 Bill wanted figures to represent the 71st Foot in the southern campaigns, and Mr Marsh sculpted various firing line and advancing figures, together with a couple of casualties and forthcoming command figures. Why do I have so many of these figures sitting on the kitchen table? First, I have a substantial number for myself. 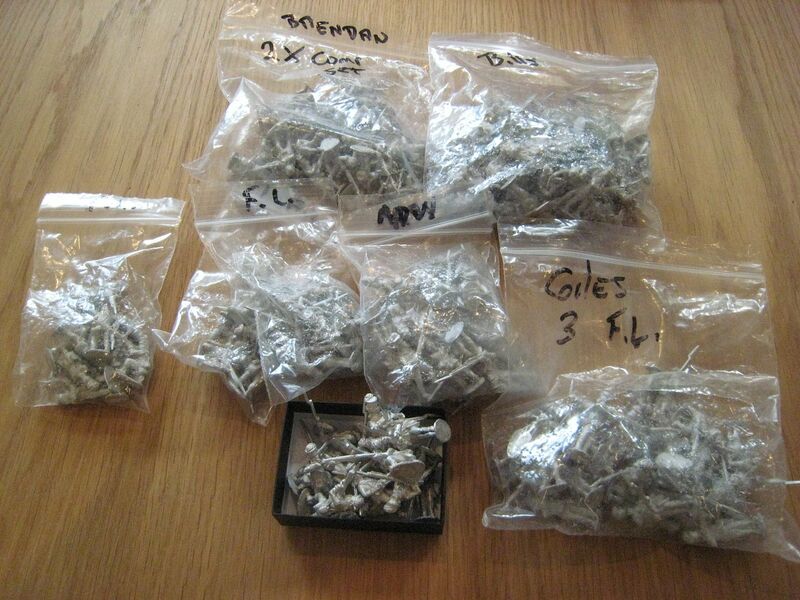 Secondly, I have been sent figures for onwards transmission to a couple of UK customers. 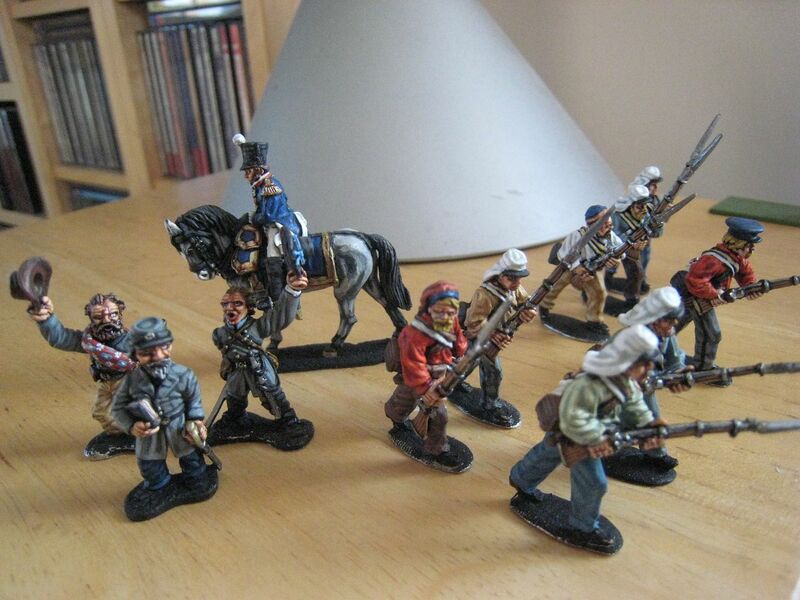 Thirdly, in return for "lead" I have agreed to paint 50-odd figures for Bill's own collection. Phew - I reckon that's most of my painting schedule for the next 4 months...! Anyway, I have a few days off work at the moment and so I thought I'd post a series of daily posts on painting some sample/test figures from this new range. These aren't Bill's figures that I'm painting, but my own - I'm just trying out some different looks so Bill can see what he might like. My plans for my own figures are not yet fully formed. 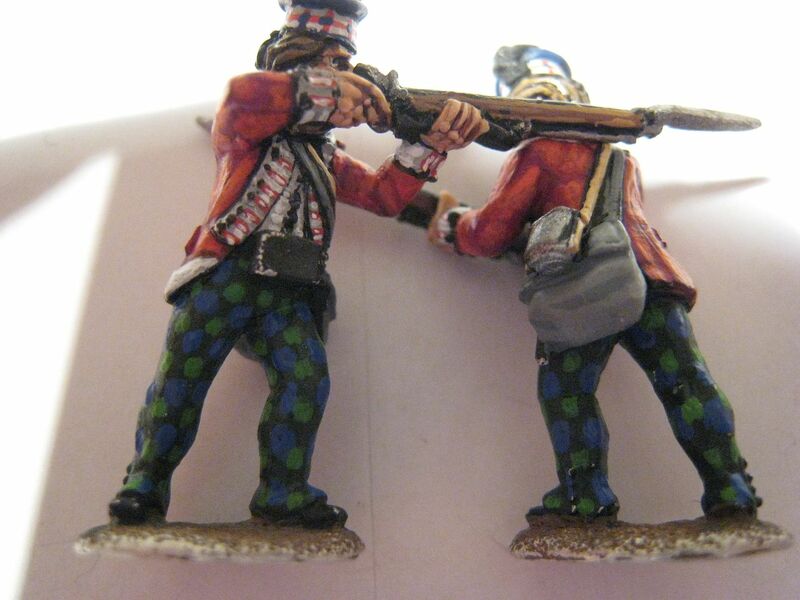 I want 2 units of the 76th Foot (32 figures) for the "British Grenadier!" Petersburg 1782 scenario, which will probably be 1 advancing unit and 1 firing unit. 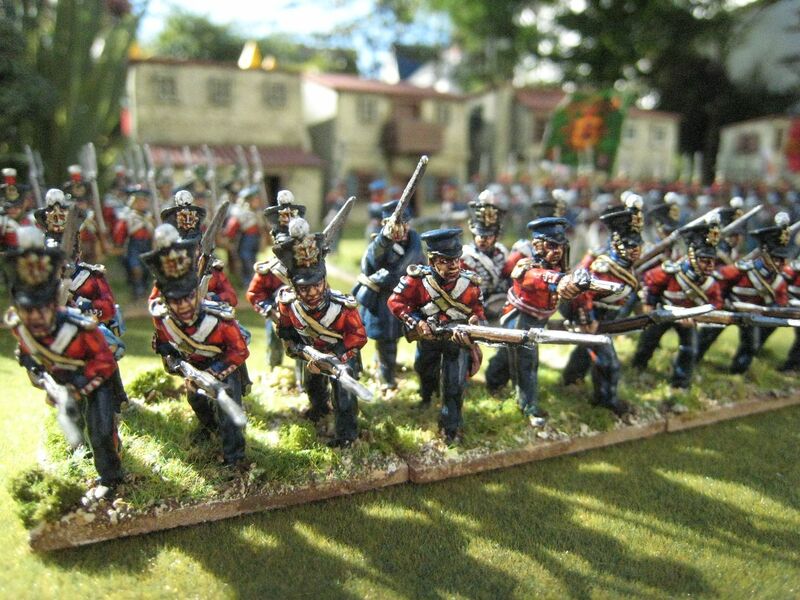 I then intend to re-do the 71st (I already have 2 battalions' worth here) for small-scale skirmish actions like Stono Ferry, for which I might look at "Sharpe Practice". 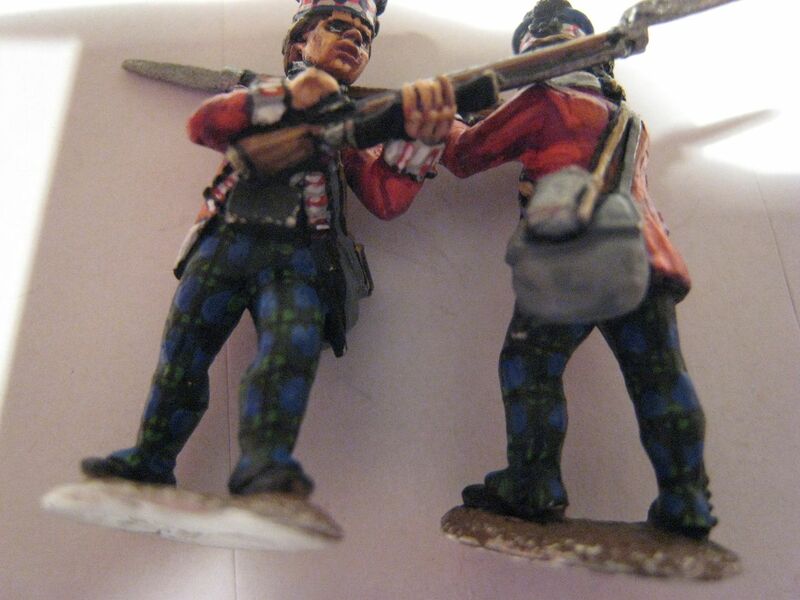 The figures are in the same dress as the Perry "later war" highlanders, but in different poses. First thoughts are that these figures are very nice indeed. They have zero flash, so tidying up takes hardly any time (jut a bit of filing on the bases). The casting is crisp and the details are well-defined. I am used to Alan Marsh sculpts and his "trademarks" are in evidence here - small buttons, large eye-sockets, open mouths and thin bayonets. The metal is very robust - barely bendable and I am amazed that in their journey from the US to London there appear to be no broken bayonets. So excellent casting. I haven't really looked into all the poses yet, but the firing line has both standing and kneeling figures; the advancing figures could also be described as "charging", I think. 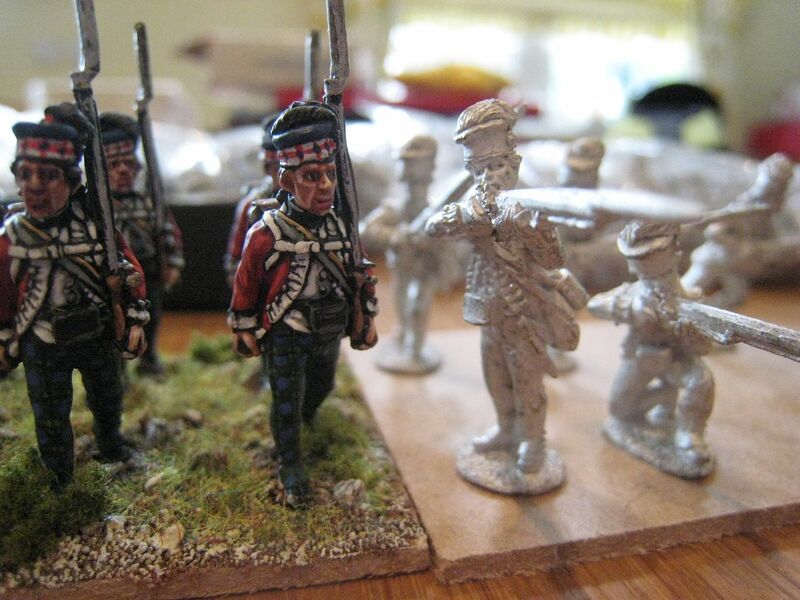 In size terms, they seem perfectly compatible with Perry figures - on the left is a photo of my original 71st Foot using Perry figures with the new King's Mountain figures; it's not the best photo, I admit (I painted the 71st back in 2005). So here's a rather dull photo of 5 figures which now have all the base colours blocked in, over a black undercoat. 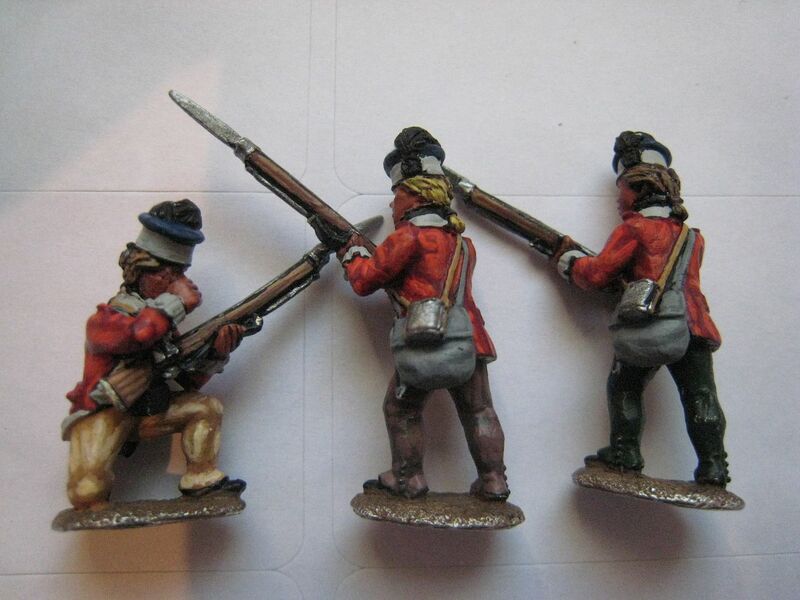 The exact colours are: flesh - Foundry "Expert Flesh 127A" with a wash of Winsor & Newton "Peat Brown" ink; coats - GW "Red Gore" (no doubt called something else now); muskets - Foundry "Spearshaft 13A" and "Gun Metal 104B"; bonnet - Foundry "Deep Blue 20A"; gaiter-trousers - Foundry "Peaty Brown 61A", "Buff Leather 7A" and GW "Dark Angels Green" (for tartan trews); haversack - Foundry "Stone 57B"; canteen strap - Foundry "Canvas 8A"; facings - Foundry "Arctic Grey 33A" for the 71st and "French Dragoon Green 70A" for the 76th. The next stage will be to do most of the highlights on the equipment and clothing. I'll do that today. I don't usually block out the entire figure - my normal method is to highlight as soon as each base coat has dried. I used to paint the flesh first, but now leave it until the end of the process. The paint I'm using as the base coat for the tartan trews must be one of the oldest in my collection of paints - an original Citadel plastic pot from, and I'm guessing, about 15 years ago? It's still going strong, along with several others of similar vintage. The photo here shows the two successor paint pots from GW - the one in the middle was the worst, as everything tended to dry up after a couple of months. The pot on the right was much better, but then they changed that and brought in the current smaller sized pot. 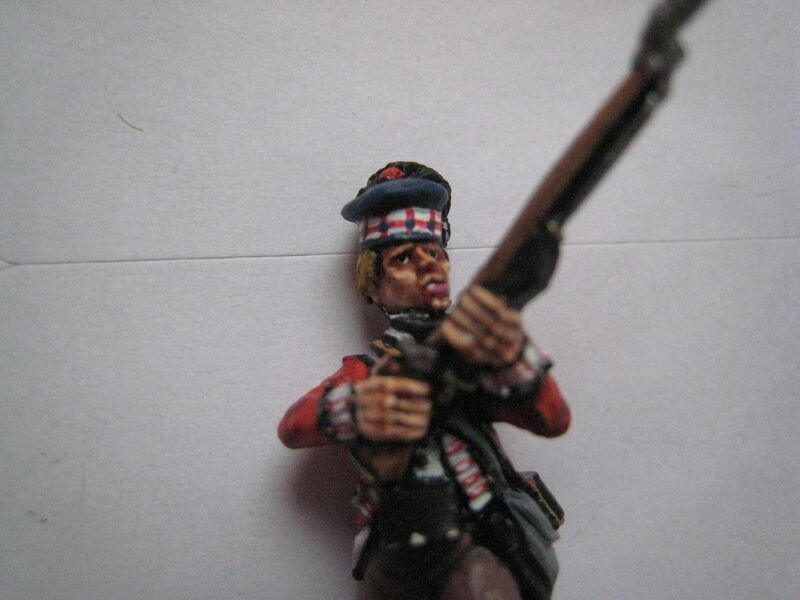 As well as the highlanders, I'm working on a couple of other things at the moment. 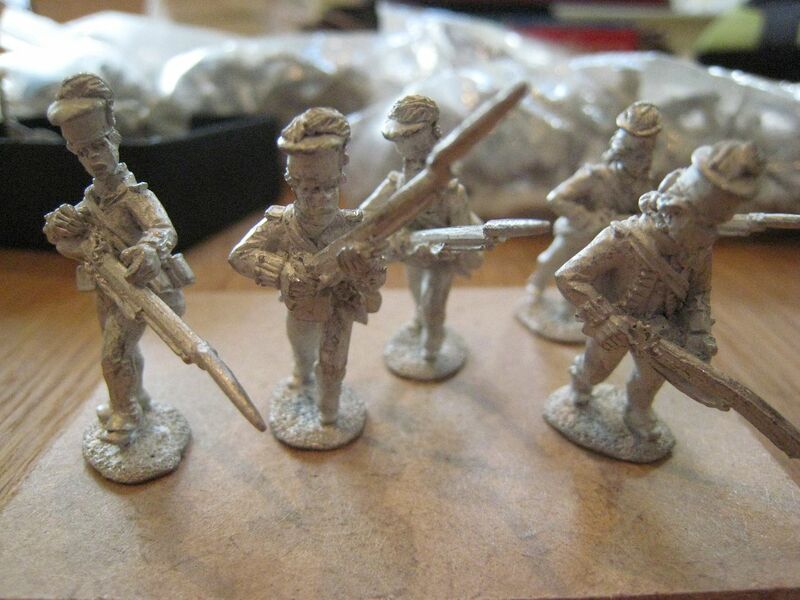 The wip shot below shows Virginians for 1861 Bull Run, the first figures for a Dixon Stonewall Jackson vignette and a French colonel for a 1815 General Bachelu command stand. I'm working on those alongside the new highlanders. 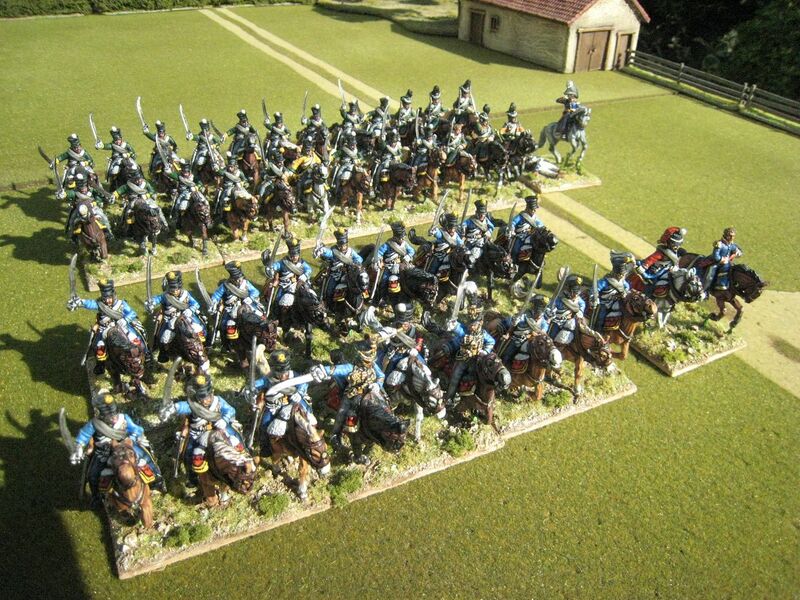 Something I'd been meaning to do for a while was to photograph the Dutch-Belgian cavalry brigade I painted a few years ago in its entirety. 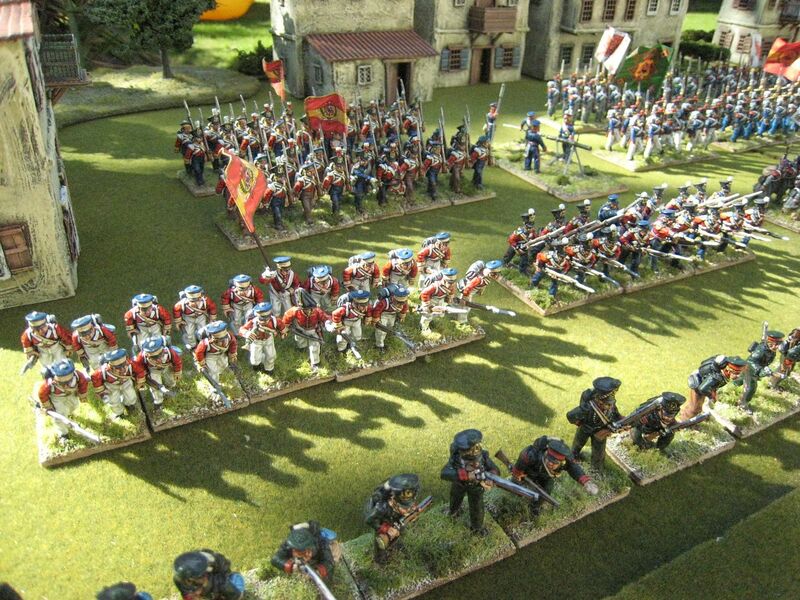 I was asked to chip in to the large Waterloo game that Loughton Strike Force put on at Salute 2007 (was it really that long ago?). 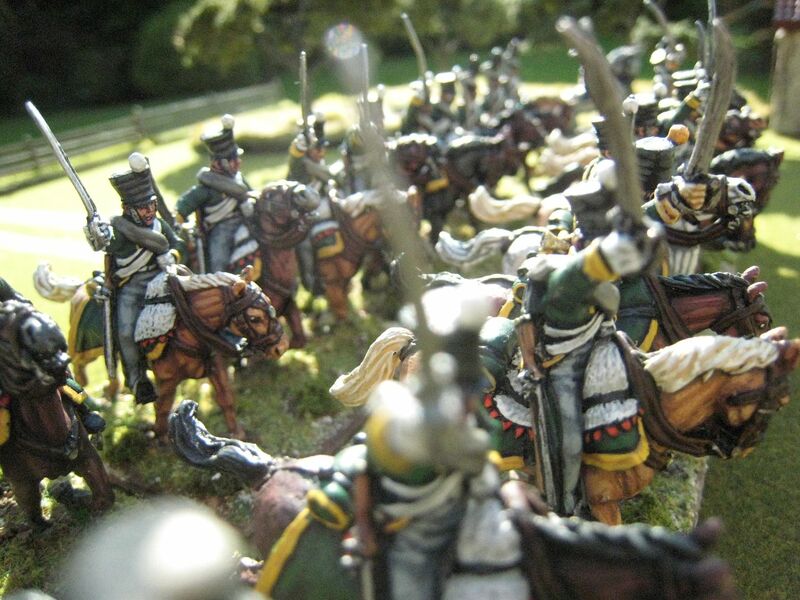 The game centred around the French cavalry charges of the late afternoon and featured hundreds of beautifully painted 25mm figures. Doug Bernie, who I recall had painted something like 150 Guard cavalry for the game, collected the club's well-deserved "Most Impressive Troops" award. 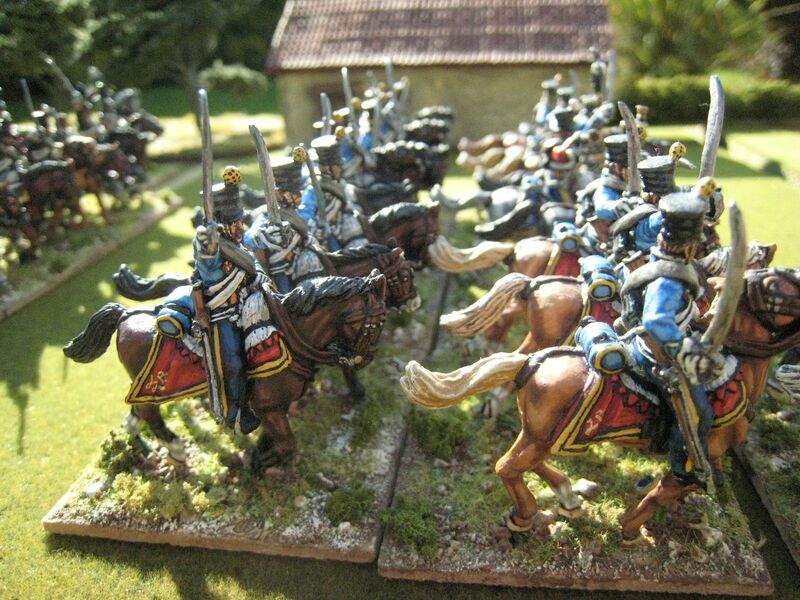 My contribution was very small: (i) Generaal-Majoor Jean Baptiste Baron van Merlen's brigade of the 5th Belgian Light Dragoons and 6th Dutch Hussars, (ii) the Napoleon command stand (see here) and (iii) a few casualties and some other command vignettes. 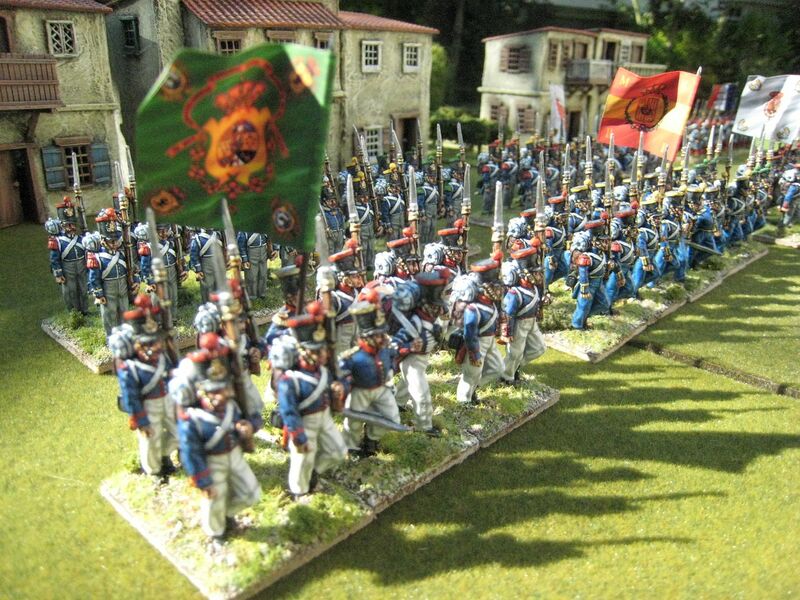 I failed to take any photos of the brigade in action, and this is the time since Salute that I have paraded the two regiments together. 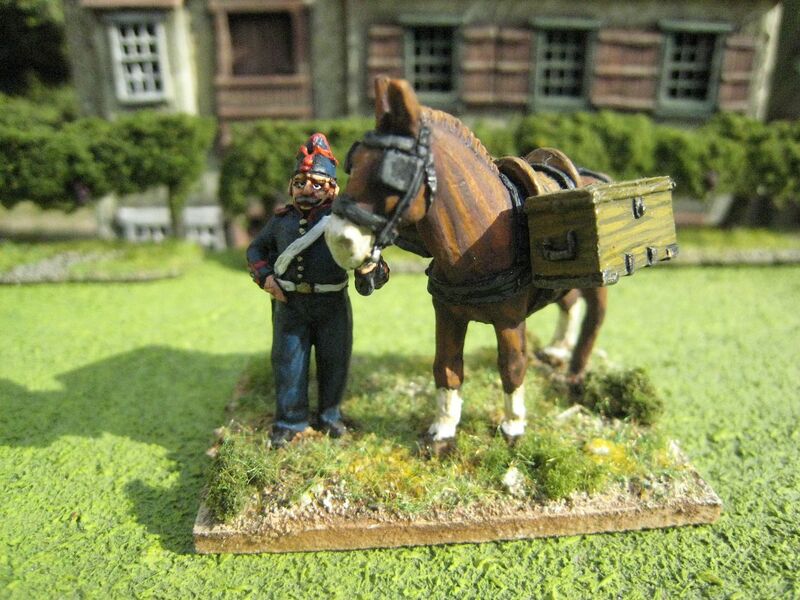 The Merlen command stand actually uses the Ghigny figure from the Perry Dutch-Belgian cavalry commanders pack. 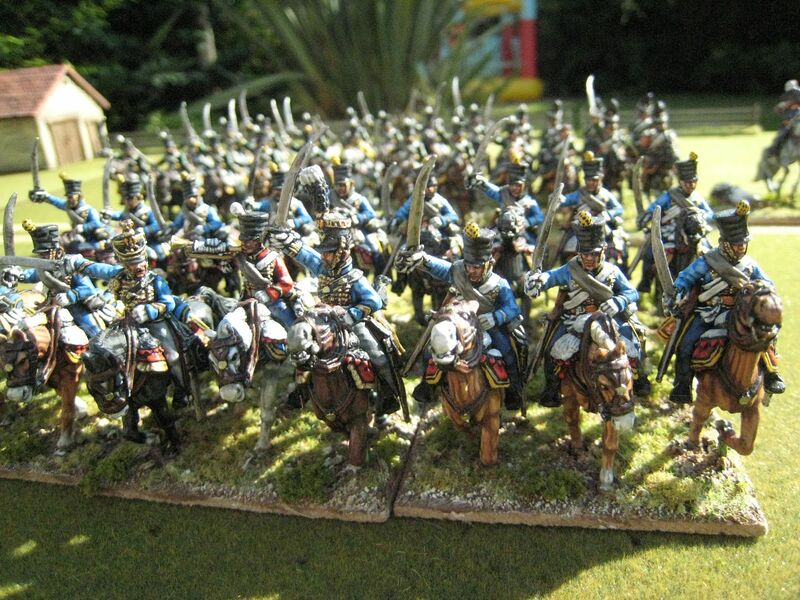 The Dutch-Belgians were the first substantial unit of 25mm cavalry I'd ever really painted. 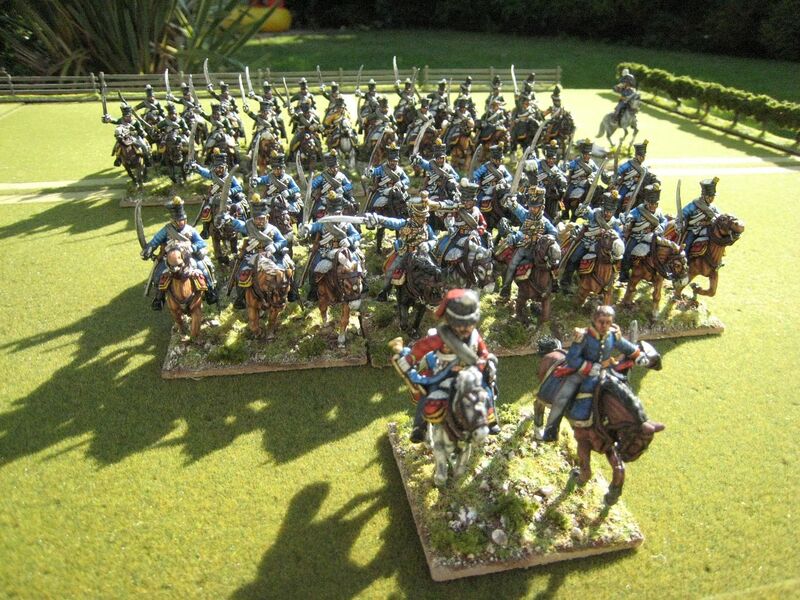 In early 2007, when I started, I was 3 years in to my AWI marathon and whilst I had painted several mounted generals at that stage I hadn't started on the cavalry (which in the AWI are only very small units in any event). 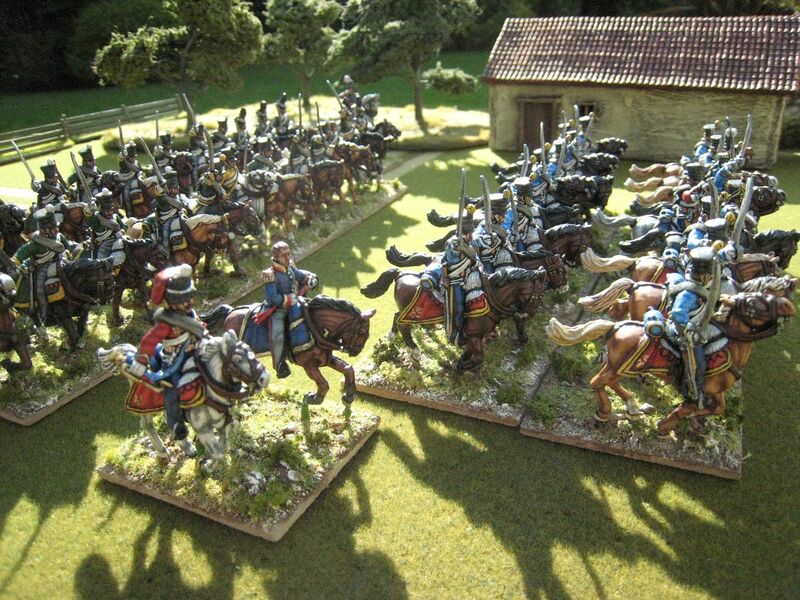 My experience of painting horses was limited to a few packs of Foundry Ancient Germans and Alexandrian Companions. For those I had used a simply base coat and dry-brush technique - quick and easy, but not very sophisticated. Oddly, despite using this hassle-free method, I had always found horses tedious and boring to paint. 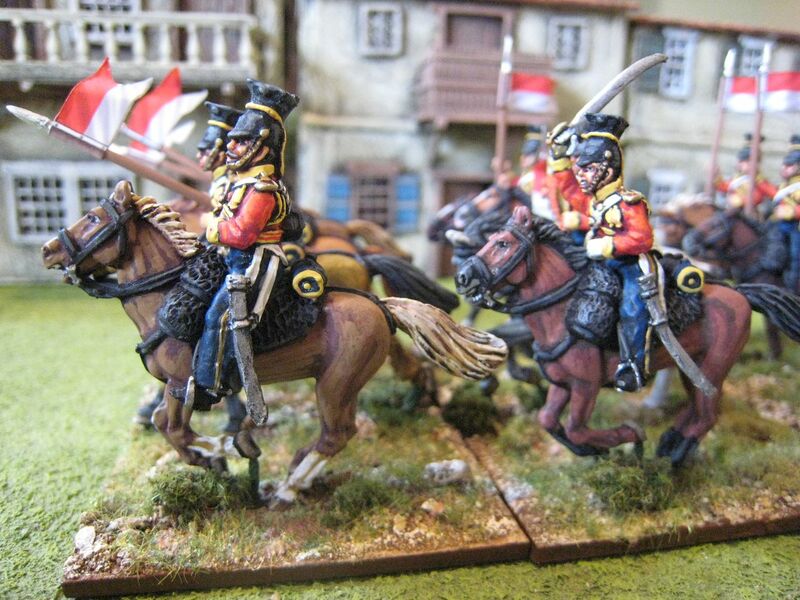 So because these Dutch-Belgians were going to be on public display, and because I wanted the cavalry to look as if I'd put as much effort into the horses as I had into the men, I began experimenting with new methods and these figures defined the way I have painted horses ever since. I suppose essentially it's nothing more than the standard 3-layer system, but I do a lot of "wet-into-wet" blending to try to make the layering a bit more subtle. I also began to look much more at photos of horses to see how markings and blazes worked and , in particular, the colours of muzzles. When I then returned to painting horses for the AWI, I decided to move beyond chestnuts and bays to tobianos and overos, on the grounds that these more exotic colours were justified by the AWI's New World setting. 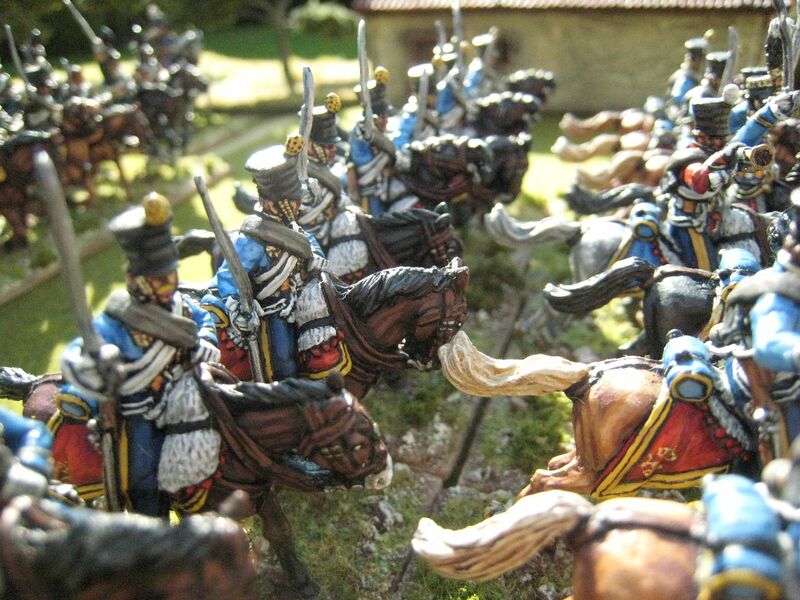 This is one of my favourite parts of my 1815 collection: my first serious 25mm cavalry, my first contribution to a demo-game (and, now I think about it, my first completed 25mm Napoleonic unit), and the figures on which I developed a more enjoyable way to paint horses. I ought to paint up the rest of the division some time! 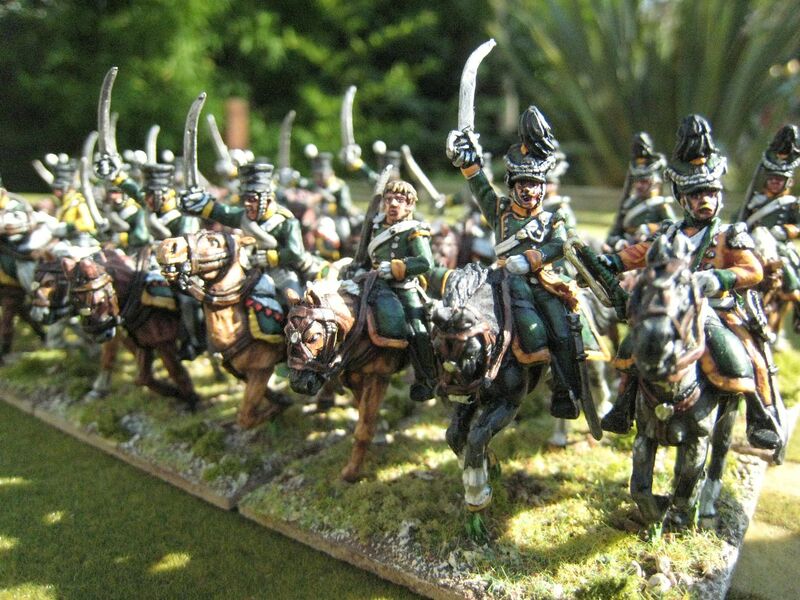 Actually, the 6th Hussars are 6 figures over strength, so the 6 Volunteer Light Dragoon figures attached to this regiment can be transferred to another one.